STANDARD CONDITIONS Ambient temperature: 25°C Working pressure: 7 bar Max working pressure: 16 bar (13 bar on F0440) Inlet air temperature: 20°C Max inlet air temperature: 100°C (60°C on CF) DF – Anti-dust protection filter suitable for the removal of solid, liquid and emulsionated particles down to 10 microns. A long working life together with a strong resistance to heat and abrasion make this filter the perfect choice for protecting your compressed air pipe system, machineries and accessories. The ceramic material is suggested for all heavy duty applications. 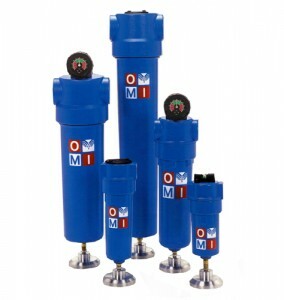 QF – Pre-filter suitable for the removal of solid particles down to 5 micron including liquids, emulsions and oil particles. The strong mechanical resistance makes this filter the ideal initial protection of a compressed air system to retain impurities and, for example, it is suitable as a post-filter for adsorption dryers. PF – HF – Interception type filters suitable for solid and oil particles up to 1 micron – 0,1 mg/m³ (PF) and 0,01 micron – 0,01 mg/m³ (HF). These filters, by means of the impact, interception and coalescing principles, compel the submicronic liquid particles, which from the inside strain through the element, to collide and thus become larger micro droplets, which will drip the bottom of the filter housing. CF – There are treatments in industrial plants which in addition to oil free air, require the elimination of oil vapors and odors. For these purposes, the activated carbon filter through the adsorption process attracts all odors and vapors left after desoiling and keep them on the surface of the activated carbon grain molecules. Owing to this PF or HF filters have to be placed before the CF filters. The element is made by thick activated carbon layer covered by fiber coating kept in place by an inside and outside stainless steel wall.